I subscribe to quite a few blogs and read a few more. When I do, I will often skim the posts and when something catches my eye, scroll back up and read it all the way through. I know when I have found something truly cool when I stop and stare at the picture, just letting it sink in. This happened recently at the Caveman Cooking Creations site. It was a glorious looking dish of creamy butternut squash, savory beef and bacon and topped with onions sautéed in balsamic vinegar. Oh my God, YUM! It is perfect for entertaining as each person can have their own boat. 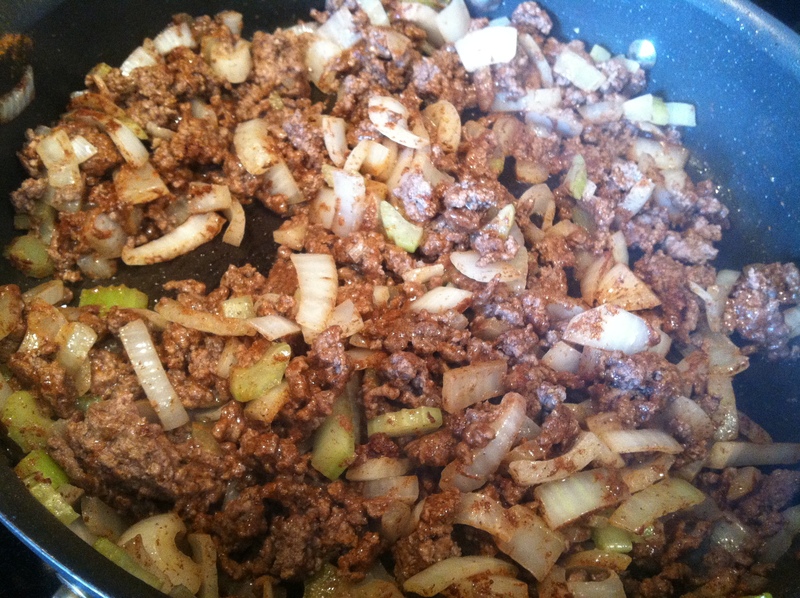 I added some meatless crumbles (not pictured) and included more bacon than the recipe calls for. The recipe calls for 3 tablespoons of cinnamon. I followed the directions and used it. Next time, I’d cut it in half. These look almost fake as they have such a rich orange color. 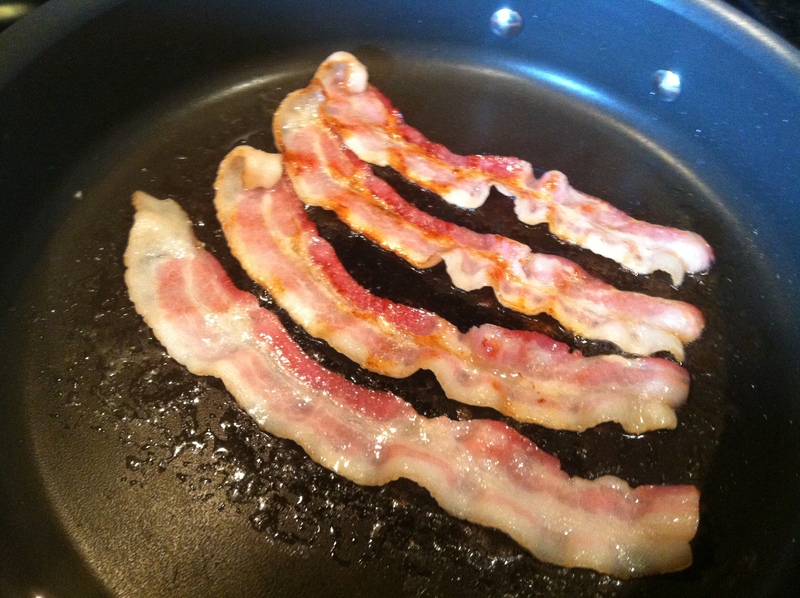 I fried up the bacon in two batches. 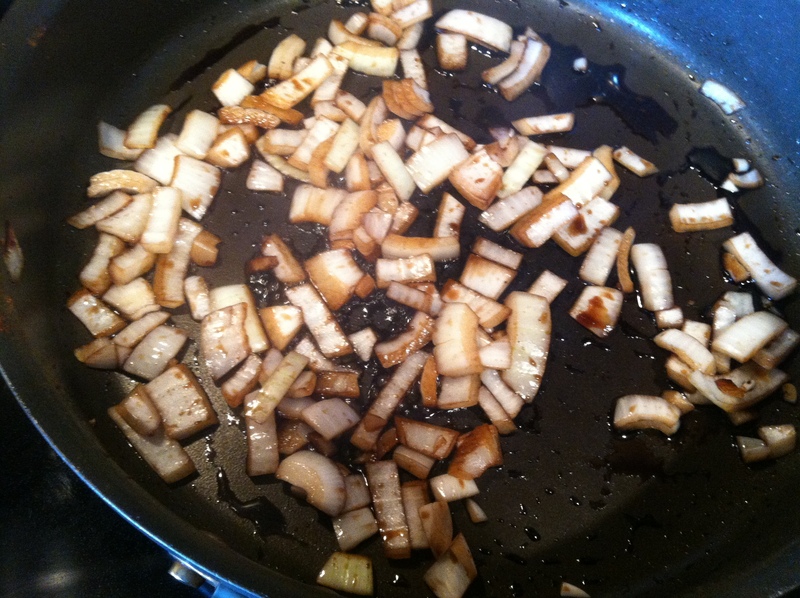 Some onions for the top. All together. The small Pyrex dish worked perfectly. 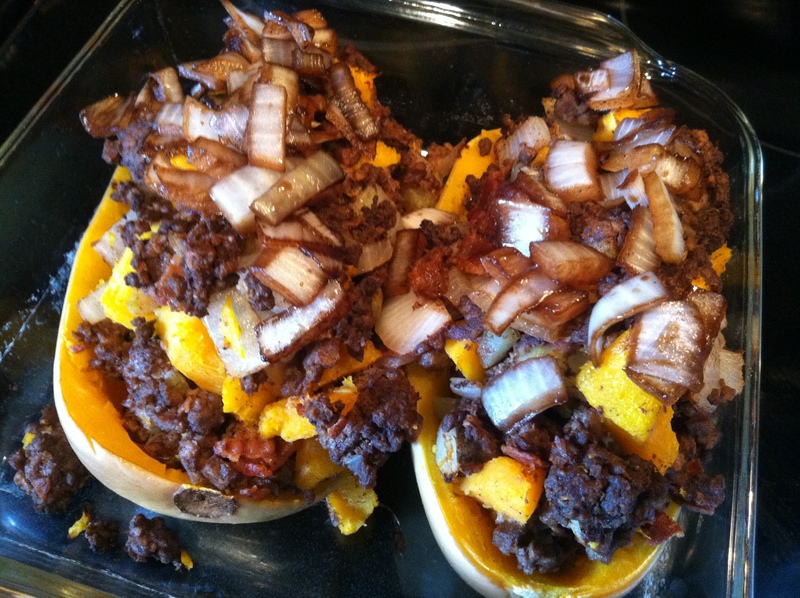 I love stuffed squash recipes! 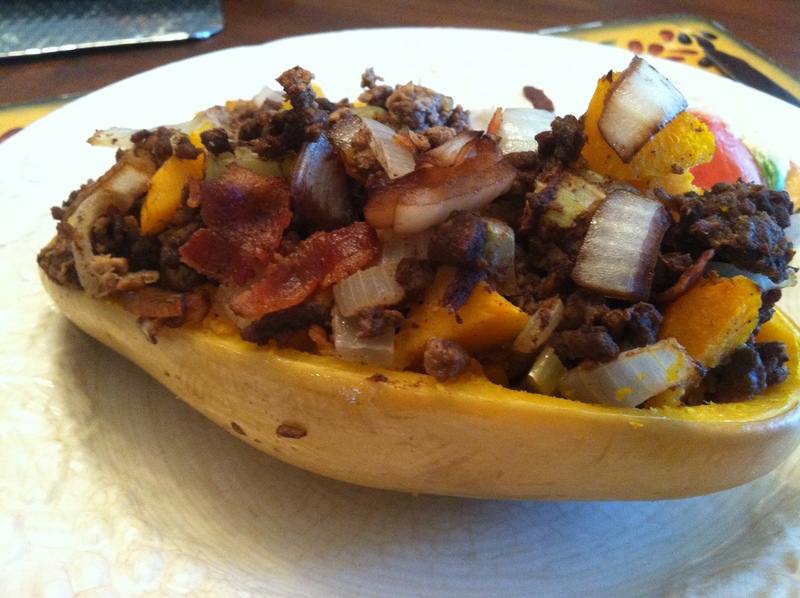 I have a stuffed spaghetti squash recipe that I LOVE! That looks amazing – butternut squash is now on my shopping list! Thanks for stopping by my kitchen, Chef! 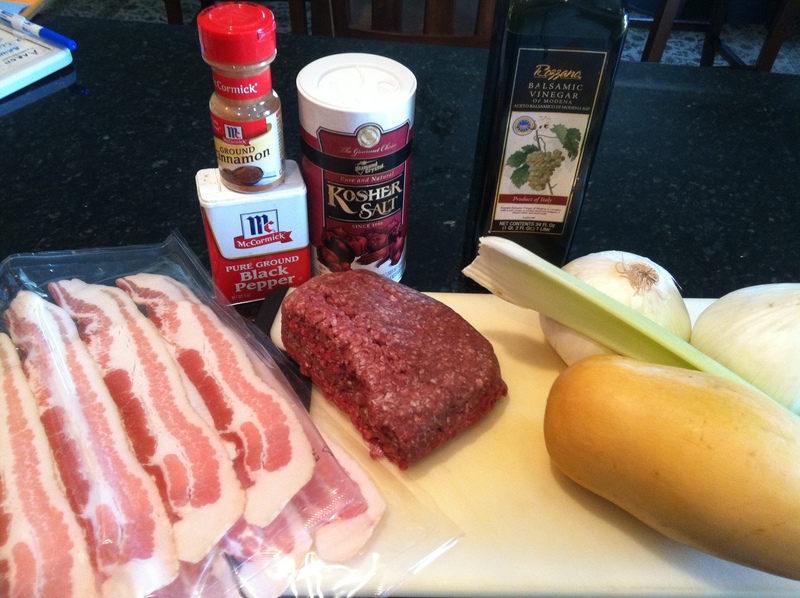 This recipe looks great – I love anything that uses bacon and winter squash in the same sentence! My red Kuri squash is ripening in my garden as we speak. Maybe I’ll try a variation in the fall with prosciutto or my new favorite caveman delight: Lardo. Fat, fat and more fat! Bring it on. oh this looks so delicious!! I’ll definitely try this recipe .. many thanks for sharing! Yeah, I scan recipes too. This one looks like a keeper. 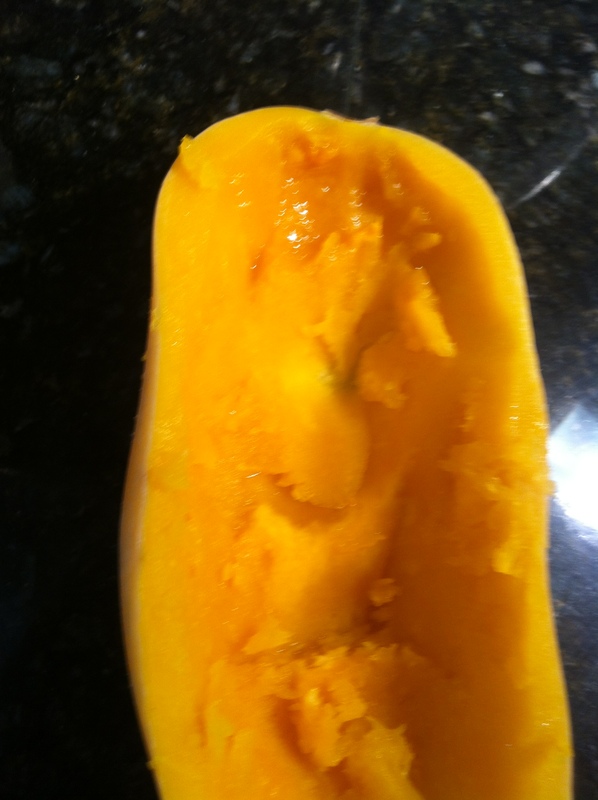 I think it would would great with large sweet potatoes substituted for the butternut squash. It would decrease baking time. 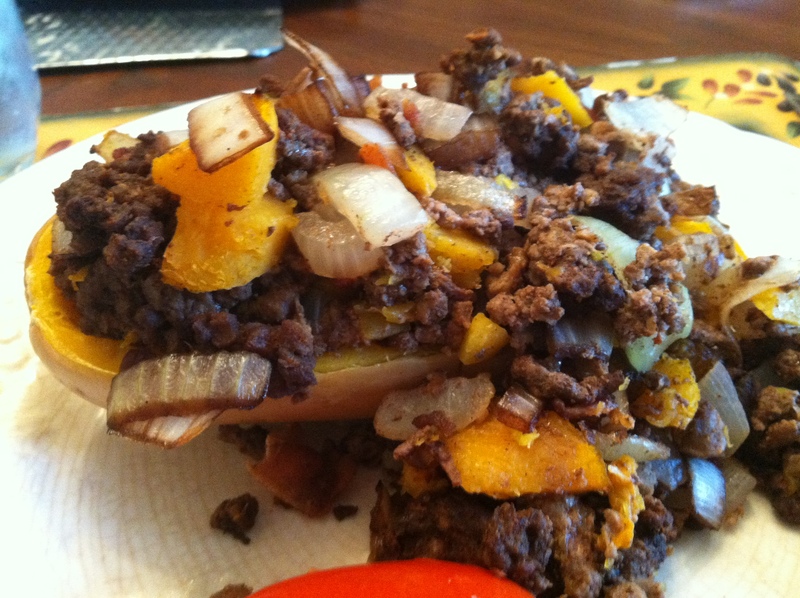 Great way to stuff butternut squash instead of sausage. Thanks for sharing. 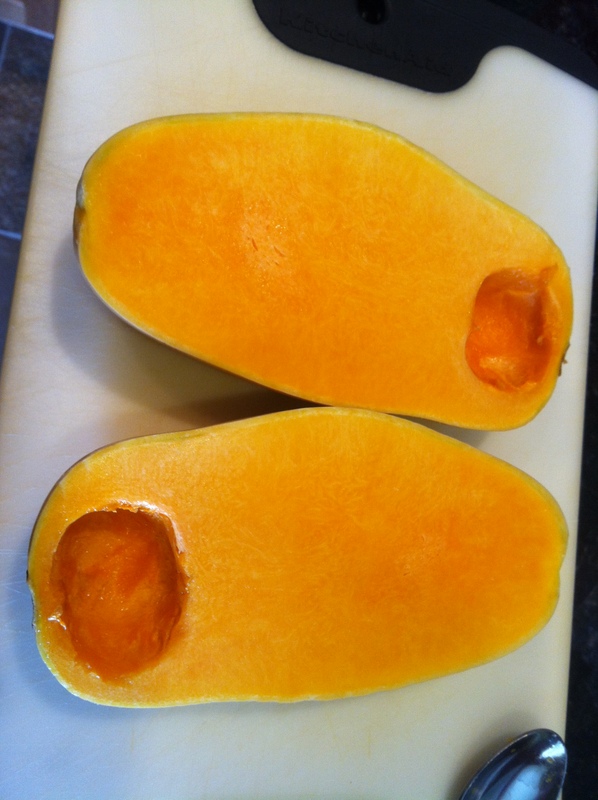 Have a butternut squash in my fridge, was wondering what to do with it – sorted! Love this recipe you have posted. I have a friend who has a “Whole Foodie” page on facebook where many “Paleo” followers, the caveman way of eating, are sharing recipes. I shared this one with her. You did a great job, I can’t wait to try this recipe for Mark and I.
I’m not really a squash fan, but thinking I need to try more of it in my diet (just cooked better than my parents used to). I try to eat Paleo most of the time, avoiding starches like the plague, so this is a great recipe candidate! Thanks!